Barb Weir: B.B., you admit to some concerns about General Petraeus. Please elaborate. B.B. : As you know, Barb, the U.S. and Israel have a relationship that goes well beyond friendship. I’m afraid Gen. Petraeus betrayed that relationship. B.B. : In 2010, he described Israel as a strategic liability for the U.S. because our struggle to liberate as much land as possible from Palestinians and our Arab neighbors is an obstacle to resolving the conflicts in Iraq, Afghanistan and other parts of the Middle East. He even had the nerve to say it in front of Congress! Barb Weir: So you’re saying it’s not true? B.B. : You’re missing the point, Barb. Truth is irrelevant. When you’re in a relationship the way the U.S. and Israel are, you can’t say things like that. We have to be able to trust each other. Barb Weir: I get it, but what about Israeli spying on the U.S.? Jonathan Pollard conducted the most massive spy operation in U.S. history for you guys. B.B. : Your president Reagan was the one who said “trust but verify”. We could never have sold any of that information to China and other countries without first verifying. 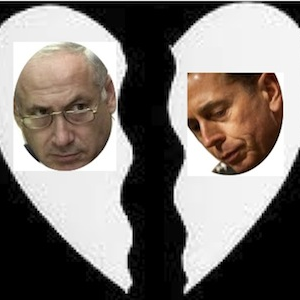 Barb Weir: So you’re saying that Petraeus lost his job because he undermined U.S. support for Israel? B.B. : Marital infidelity is one thing, but infidelity to Israel is unforgiveable. Fortunately Paula Broadwell came to Israel as part of a cadet exchange program when she was at West Point, and ended up in a position to help. These exchange programs with the military and law enforcement are really paying off. Barb Weir: Then why did she also provide information on marital infidelity for Petraeus’ successor, Gen. John Allen? B.B. : Allen was the wrong choice, Barb. Fortunately, it’s all being straightened out now. Barb Weir: How was he the wrong choice? What has he said or done? B.B. : He’s OK, but there is a much better choice that should have been exercised, and now we can do that. Barb Weir: Really? Who’s more qualified? B.B. : Retired Congresswoman Jane Harman is being considered, and she’s the perfect candidate. She’s a dedicated Zionist, has always voted with Israel and has sponsored lots of legislation on our behalf. What more can the U.S. ask for than a CIA Director that is sworn to defend Israel’s interests?